UPDATE, as of the Summer of 2016 – the “FD Connect” has been renamed the Floppy Drive Emulator, as part of the Connect Series (Floppy Connect). 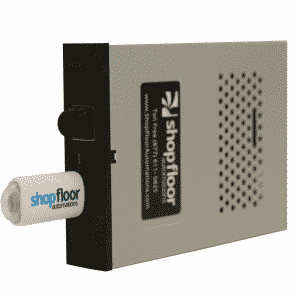 Shop Floor Automations has updated its FD Connect solution, which eliminates cumbersome floppy disks on the manufacturing floor. The new model includes support for Mitsubishi WireEDMs, Bridgeport and Siemens controls. The released model is also available in a “Universal” model to allow emulation of drive type such as Sony, IBM, Citizen, Teac and NEC, commonly found in older CNC controls such as Haas, Fadal, Mazak, Okuma, and Anilam. “Floppy disks are easily damaged in the shop environment due to dirt, oil and grime and are becoming impossible to replace. The FD Connect solution eliminates the need for floppy disks making it an ideal program and data storage solution for industrial equipment and machine tools,” said Greg Mercurio, President, Shop Floor Automations. The device is a simple plugin thumb drive that allows easy transfer of files to the Floppy Connect. Users simply remove the existing drive and the FD Connect plugs directly into the ribbon and power cables of the old drive. It is compatible with 720K or 1. 44MB systems. Our Floppy Drive Emulator, available in two models, acts as a Floppy USB Emulator, is easy install, requires no system configuration or debugging, & replaces the need for floppy disks, which are very difficult to obtain. The drive emulates your existing floppy drive & acts as if the floppy drive was never removed. Works with almost any existing 720k/1.44MB capacity DOS format floppy drive. 28 or 32 pin ribbon cables systems are supported & will connect to your existing power cable. Works in PCs & in CNC machinery such as Haas, Mazak, Fadal, Mitsubishi, Omniturn, Centroid, Robots, Flame Cutters, & Greco boxes, with new models being added to our compatibility list monthly! Your time is valuable in the shop floor environment. Stop using it to search for old media! Our Haas Floppy Emulator is also off-the-shelf in functionality and pricing!